Once again we bring home an amazing result obtained in one of the most famous and prestigious Clubshow in Europe !! 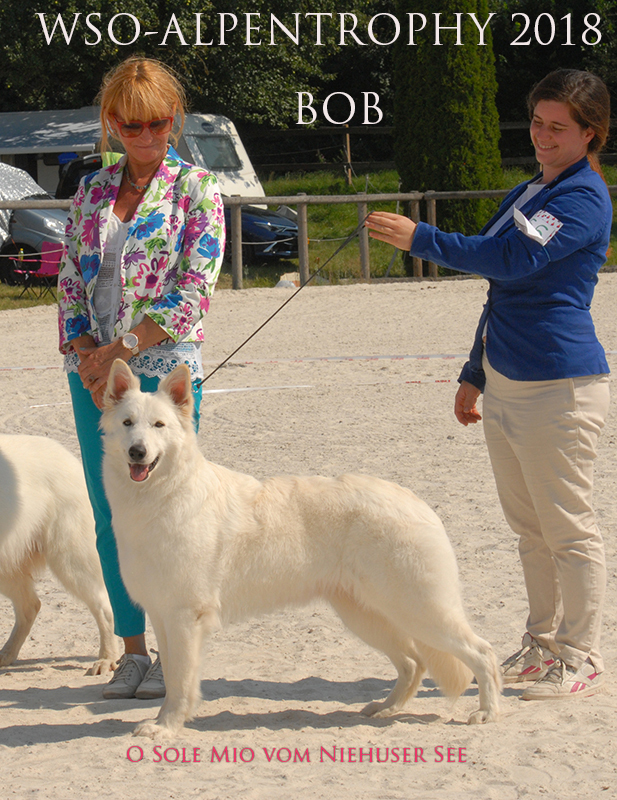 WINS the BEST of BREED (BOB) !!! Our kennel is located in the countryside of one of the most beautiful regions of Italy, Umbria, land rich in art, history, nature and spirituality and I wonder if the air you breathe in these parts more or less consciusly influenced my life....the fact is that I have always had a great respect and fascination for everything that tells of nature and life. 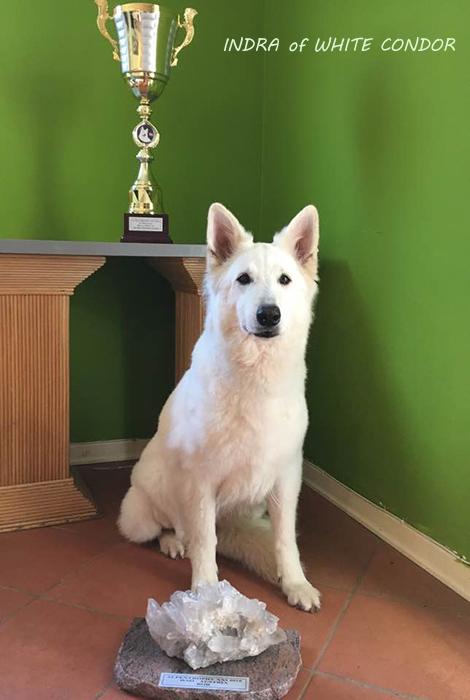 In 2006, with the death of Rocco, my loved German Shepherd the last Greta's son of the last litter, I started looking for a new puppy and for a curious and fortuitous set of circumstances I found myself in front of a wonderful German Shepherd, but completely white! !.......a White Swiss Shepherd !!!! A breed almost unknown that has changed a lot of my life ! Afterwards I began a new adventure with these creatures so fashinating in their look and also story! Indra comes from a great Kennel and also her genetic is great, during these years I have tried to maximize her morphological and reproductive potential with targeted breeding, planned in endless nights and realized powerfully and with a touch of adventure !! The Swiss Shepherd exists in two variants of hair, short hair and long hair, both very beautiful, but for now I have decided to give priority to long hair! The breeding criteria that I have chosen to share are the costant search for good health, good character, beauty and type, for this reason I seek carefully, for my females, the males that more than others are bearers of these features. .....puppies available....... their story week by week ! My "Swiss" family living and they are full members of the Family! So even the puppies that are born and live in the home in contact with people and situations the most diverse, when the weather allows the large garden that surrounds the house welcoms them to new experiences outdoors with other animals, sounds, noises and everithing that the environment of the countryside can offer them. 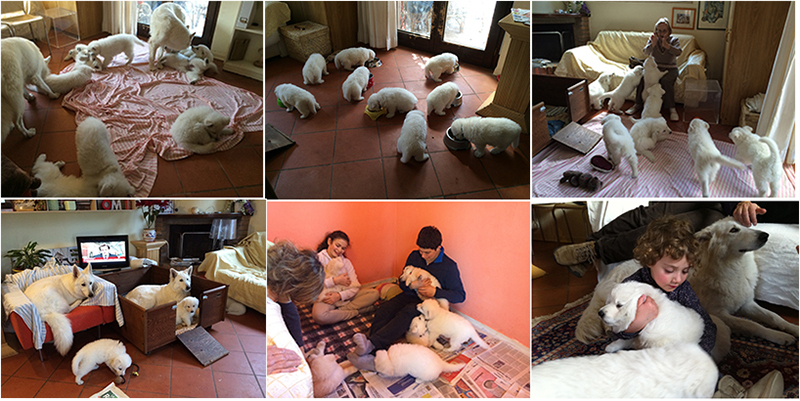 Lungoresina puppies are growing..... often they come back to visit us .... and it's always great fun!!! The work done thus far makes me fully satisfied, my "Swiss" were healthy, with good character and they have had successful not only in showrings, but allso with the wonderful owners who have appreciated them and are falling in love with them! Yes! !.....a White Swiss Shepherd is a creature who takes you completely, he's a faithful friend who loves his uman friends and all the things around them, but also an alert guardian who needs a little time to became friendly with the unfamiliar people! Primarily he loves his human family and everything that revolves around her, always ready and active to collect the stimulis that are offered him. Super Champion TORUK MAKTO has his website!! the competence and seriousness that distinguishes the work of Austrian friends. The Prestigious and famous International Club-show in AUSTRIA!! A great emotion again !!!! and again.....for two consecutive years we bring home the precious "BergKristall" Trophy!!! It was only last year, 2016, our foundaation Lady, INDRA of White Condor gave us "the dream"
BEST of BREED to ALPENTROPHY !!! All this is fantastic and encouraged me to continue the work I have undertaken with the determination and seriousness that have characterized me here. A White Swiss Shepherd can add only joy, beauty and elegance to one who will take care of him !